A year ago I shared a post called Momentum in a Fixed World. 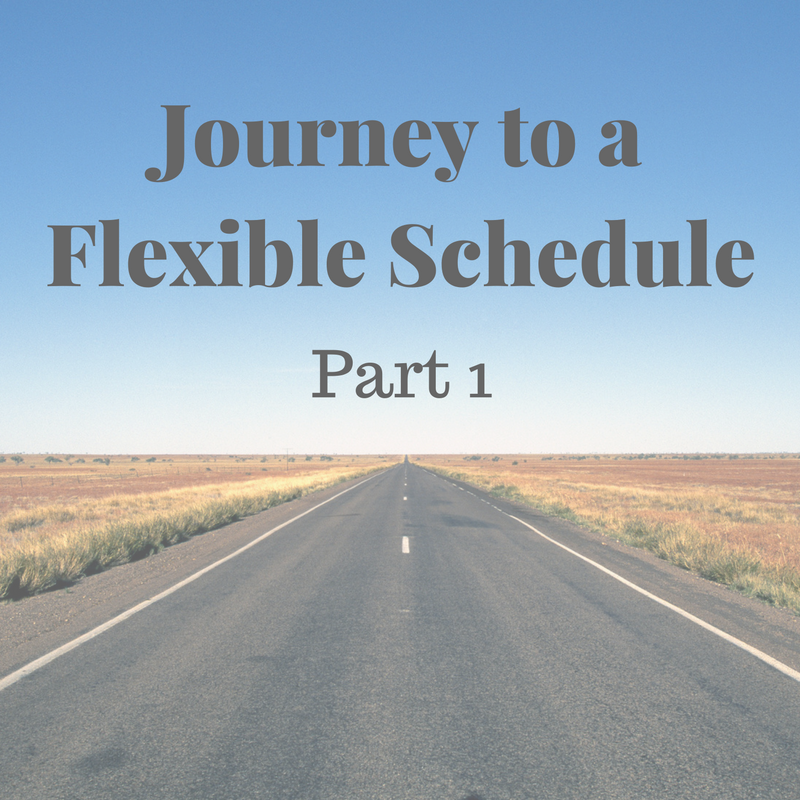 In this post, I shared the goal to move to a flexible schedule. Just as planned we transitioned to this type of schedule with the first- and second-grade students this year. The library works with 261 students that are enrolled in preschool to second grade. We decided to start with our oldest students when making this change. This is a new approach for everyone involved and will be the main focus of my library journey this year. Presenting to My Colleagyes: My school director has been very supportive of this transition from the start. She sees the value in the library having a flexible schedule. Last June, she gave me the opportunity to roll out “the plan” at our faculty meeting. 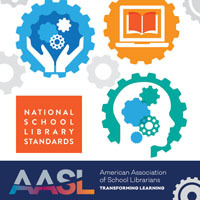 I shared the library data from the year and then explained the flexible model. This gave me a chance to share the benefits with all faculty members. This also allowed me to share that first- and second-graders would still be learning the same skills as before, but they would no longer be in isolation. Questionnaire: In an effort to start the collaborative process, I had teachers fill out a quick questionnaire if they had an idea in mind. This way, I can now revisit these notes to see what we can build on together. I received eleven questionnaires from that meeting. Two collaborative projects have already been developed from the ideas! Team Meetings: In August, before school began, I got myself invited to the team meetings. In these meetings, I shared my vision for what this type of schedule would allow us to do. I gave my colleagues talking points in case parents should question the new schedule. We also discussed what concerns the teachers had. Menu of Options: Many of the concerns were related to trying to add me into their already busy schedule. To help show teachers that the goal was not to be an “add on,” but to be a part of what they were already doing, I came to the meeting with a menu of options. This menu is meant to be a la cart. I stressed that these were just ideas. We could do all or none of them based on what fit best for the needs of their students. 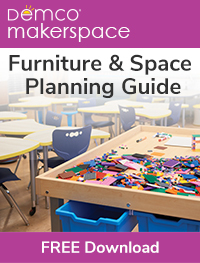 I plan to create this on a monthly basis with different lesson options that will tie to the curriculum. This way they can see the many ways I can be helpful to them. Additionally, I will have evidence to show the administration when they ask what I did to help develop a collaborative relationship with each teacher. This is not meant to replace their own ideas, but just give us a place to start. Digital Planning Form: I shared a collaborative planning form that was created in Google Forms with all teachers from preschool to second grade. 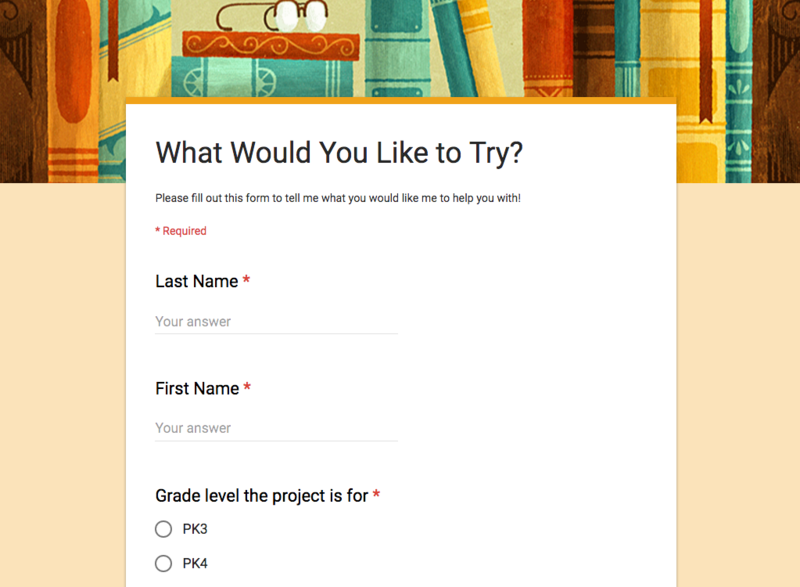 This form can be submitted if they have an idea they would like help with. When shared, I walked teachers through the steps of creating a bookmark so they all have the form at their fingertips. During the month of September, I was able to work with first- and second-grade students on thirty-six collaborative lessons. I have seen these students more than when using a fixed schedule. Additionally, teachers are beginning to see some of the ways we can “marry” our curriculum to accomplish more with their students. Keeping My Mojo: For me, the most challenging thing so far is trusting myself and my direction. It is easy to get caught up in what is not working instead of focusing on what is. Remaining positive is usually a strength for me, but I have found that I have been second-guessing myself. I do believe that a flexible schedule will provide the most benefit to the students I teach. Yet, remaining confident can be difficult when not everyone shares your vision. This is something I am going to have to keep reminding myself as the year moves forward. Book Check Out: We still have a fifteen-minute check out time each week. I would like to move to a come-when-you-need-a-book type system, but for now we are using a group check out model. I have been training the teachers how to check out books. This will make it so I do not always have to be there during check out. Then I can make more time available for collaborative projects. 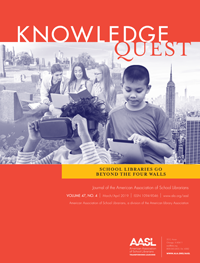 Do you use a flexible schedule in an elementary school library? Please share your story! I am in a Title 1 K-5 elementary school. 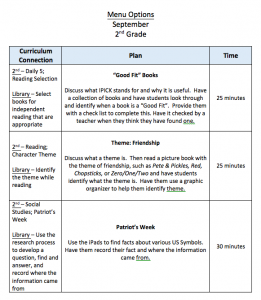 This year I became flex for grades 3 – 5. My K – 2 classes are still fixed. I also have open circulation for grades 3 – 5. To begin the school year I asked all of the 3 – 5 teacher so sign up for 2 orientation classes and they were required to stay with their classes. In the first class I reviewed media procedures and spoke about how the new schedule would work, thus sharing with students and staff ideas of how the schedule would work. The second session was geared towards digital literacy and again the teachers were asked to stay for informational purposes. Because we are a Title 1 school, I opened my flexible times to include Title 1 teachers, CCR teachers, AIG teachers, School counselor and anyone else who was not a part of the regular classroom. I created 2 forms for collaboration, 1 for signup an 1 for planning. 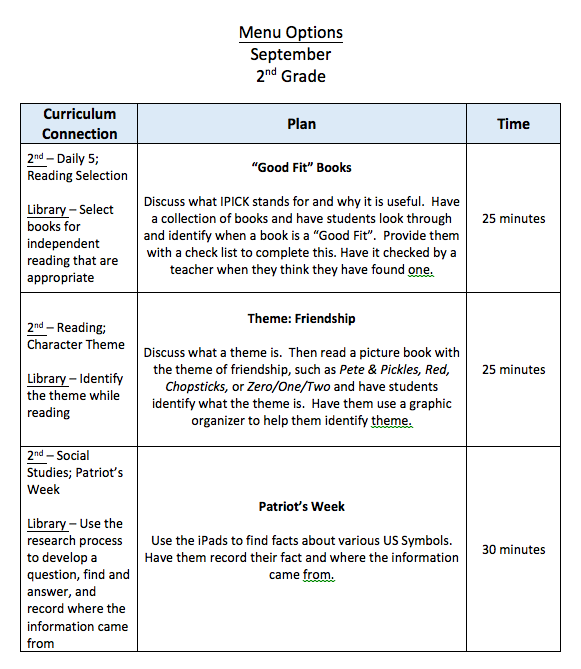 On my planning sheet I included items like, use the media media center with or without media specialist, media specialist with me in classroom, small group, use media computers, etc….. in addition to curricular standards. Thus far i have created 5 collaborative lessons, worked with teachers/students on testing and more is on the way!!! Super excited this year, but exhausted too!! I am a K-6 school with weekly scheduled classes. This year, out of the blue, my principal mandated that the teachers accompany their classes and collaborate with me. As you might imagine this isn’t going over well with them. They feel like they are losing a planning period, and because I’m still seeing every class once a week, it’s very difficult to find time to plan together. I love your menu of ideas! I think this might help with the planning part. I’m really hoping that this year gives the teachers a taste of what I could offer in a fully flexible environment. Thank you for sharing your ideas and I hope you continue to share through the year. Thanks for sharing! 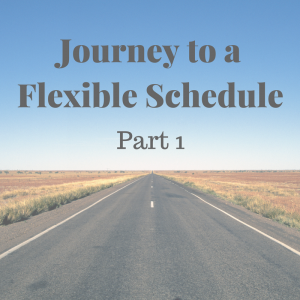 I am always interested to hear how other elementary schools are using a flexible schedule. I would agree with being exhausted! I have been using my Outlook Calendar to keep track of lessons because things have changed so much from day-to-day. I ran into a lot of resistance when I first tried to switch over to a flexible schedule two years ago. It took two years of a hybrid type schedule for teachers to begin to see the advantages. That has made the change happen a bit more smoothly! I do plan to share again in the middle of the year and at the end. Thanks for reading! I work in a K-4 building as the Information Literacy Instructor and as I’m sure all of you do, I wear many hats. 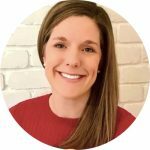 The position has never been clearly defined (I’m not sure it can be as we meet the on-demand needs of staff and students in so many ways) but we have tried many iterations of a schedule – each with good and not so good points. We are totally flex this year except for K and 1 and grades 3 and 4 are on a “come when you need a book” model. We’d love second to be that way, too; however, teachers prefer to bring their own class. As you know, we lose that intimate conversation when the entire class is in there but it works for the teachers. Slowly, slowly we are making headway with teachers and I agree it will take a couple of years to get many teachers on board. There will always be those couple that just don’t have the same vision…and are resistant. BUT….success all depends on the relationships that are formed and often it is a just jump in and do it without proper relationship and trust building simply because when is that supposed to happen. Flex is good…I think the advantages will show up in the next year or two.